Please bear with us these next few weeks as we undergo a renovation of our auditorium. Starting May 26 we’ll be using folding chairs until our new chairs arrive at the end of July. Let us know if you can help with setting up chairs Saturday evenings during this time. After 22 years our auditorium is in need of a facelift. To kick things off we’re having an all-church workday Sunday, May 19, after the second service. Wear your work clothes and give us a hand taking out all the pews, carpet and tile. Lunch will be provided. Sign up here and bring a tile scrapper if you have one. Crew I'd like to serve with. Would you like to help with recovery efforts from Hurricane Harvey? Multiple trips are being planned. We’ll leave Friday evenings at around 5 pm and return Sunday around 9 pm. Let us know if you have a free weekend to join us. Removing all water damaged materials including carpet, sheetrock, and insulation. All this has been done. We are now focusing on rebuilding. 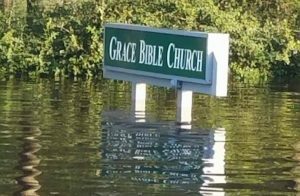 It’s a small free grace church with no insurance. They really need the help. • 2nd priority- homes. Most of the homes in the area are flooded including the pastor and church members who lost everything. Sleeping on the floor in the church. Make sure you are current on your tetanus shot! work gloves and clothes. We are going to get dirty. cot, pillow, sleeping bag, mat or whatever will make you comfortable. We are also accepting donations to help with the storm recovery. Designate gifts “Hurricane Relief”. Thanks so much for your willingness to serve the Lord in this way. Church Family Meeting from Cypress Valley Bible Church on Vimeo.